The product on the image refers to Special Size. The Vase is not included in the price unless when explicity indicated. The colors of the past, lilac yellow and white, combined in harmony in this gorgeous bouquet, do you deliver the bouquet "Vintage" to a special person, for their birthday or anniversary. 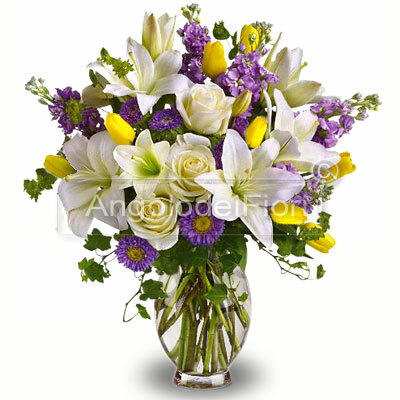 This bouquet includes white lilies, yellow flowers and lilac. * Vase not included. You can apply for it in the next step. For what occasion you are sending these flowers? Can not find the words? Consegna fiori a domicilio, Spedizione online di bouquet, mazzi di fiori, piante verdi e fiorite, composizioni per occasioni speciali e per lutto.